In taking our tools to new platforms to help people better understand the complexities of climate change, we have released the Climate Pathways app for the iPhone, iPad, or iPod. This free app, available at the Apple App Store, enables people to chart a course to a future that limits global warming to 2 degrees. We developed the app with Todd Fincannon who took our C-ROADS simulator and did the heavy lifting to program it for iOS devices. While not as robust as C-ROADS, Climate Pathways shows people that reaching the widely held goal of 2 degrees will require a little more than just leveling off our emissions—a pathway that, while difficult, could still be achievable. My first app for iPhone and iPad has been published in the App Store by my development partner Climate Interactive. I started with the idea of publishing an ebook with embedded simulations to explain the science behind global warming and climate change. The climate system is complex with many surprises in its behavior. I thought it would be interesting for people to find out for themselves how delays in the system mean we have to reduce greenhouse gases now, before the really bad impacts have become apparent. When Drew Jones at CI proposed an app that would deliver the key insights in a focused way, I ditched the ebook idea and worked with the CI team on realizing Drew’s proposal instead. The result is Climate Pathways. There’s a thermometer on the left that shows the temperature rise at 2100. 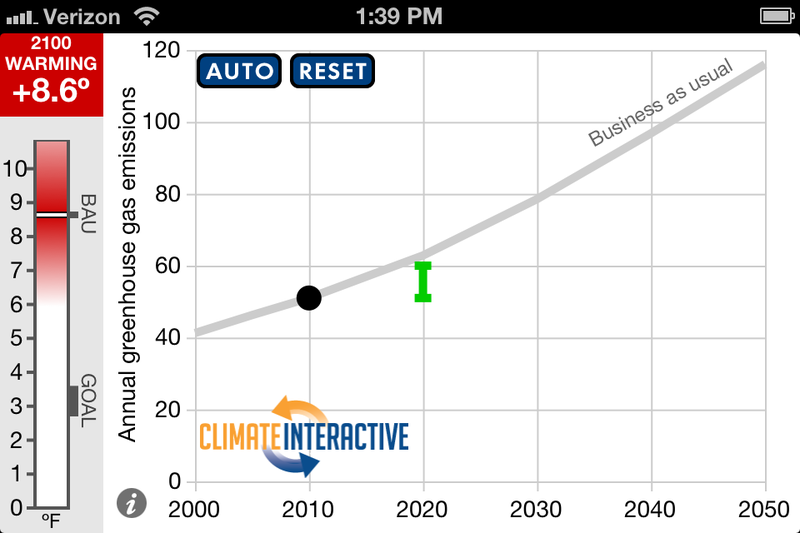 To use the app, you trace a greenhouse gas emissions curve from 2010 to 2050. The gray curve shows our current, disastrous path for reference. The app instantly calculates the temperature rise in 2100. Your task is to find a scenario that results in a temperature rise of 2ºC (3.6ºF) or less. If you get stuck, you can try “auto mode” and sweep your finger around to find 2ºC pathways calculated by Lori Siegel at CI using the full C-ROADS model. The little info button gives you some background information on the climate system and our current situation. The app page at CI features a demo video showing the app in action, narrated by Drew Jones of CI. This video shows how effective an interactive simulation can be for illustrating the behavior of a complex dynamical system. The Climate Interactive team took iPads to the UN climate conferences in Cancun and Durban. People there really liked how it gets the point across. Hopefully, we’ll be able to do a lot more with it soon. So if you have an iPad, iPhone, or iPod Touch, head on over the App Store to download your free copy of Climate Pathways today!